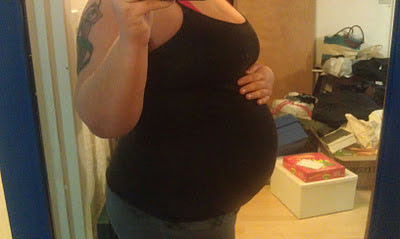 Barefooted Mama: 22 Week Update! How big is baby: He is 11 inches long (about the size of a baby squash, Kaileb weighs almost 1 pound. Maternity clothes: I wear maternity jeans and some tops, but for the most part have been rocking the hell out of yoga pants and long tank tops. Stretch marks: Starting to get some at the top of my tummy, hopefully they will not get to much worse. Sleep: Getting a lot better. Seems like my sleep schedule is getting a lot better, *knock on wood* that it keeps up and I do not revert back to how bad my insomnia was. Best moment this week: Kaileb rolled over and I was able to feel it. He rolled over from the bottom of my belly button and rolled to the top of it. It was the coolest feeling ever! Craving: Still craving hash browns, eggs and Tabasco. I have been drinking chocolate milk more and my strawberry craving is back now that I found a place that sells fresh strawberries. Score! What am I looking forward to: Honestly I really do not know yet, I am only half way through this pregnancy so I guess I am looking forward to the third trimester. Milestones: Kaileb is starting to look like a miniature newborn. His lips, eyelids, and eyebrows are becoming more distinct, and tiny tooth buds are starting to develop under the gums. His eyes have formed, but the irises (the colored part of the eye) still lacks pigment at the moment.